Georgia on My Mind – Thar She Blows! 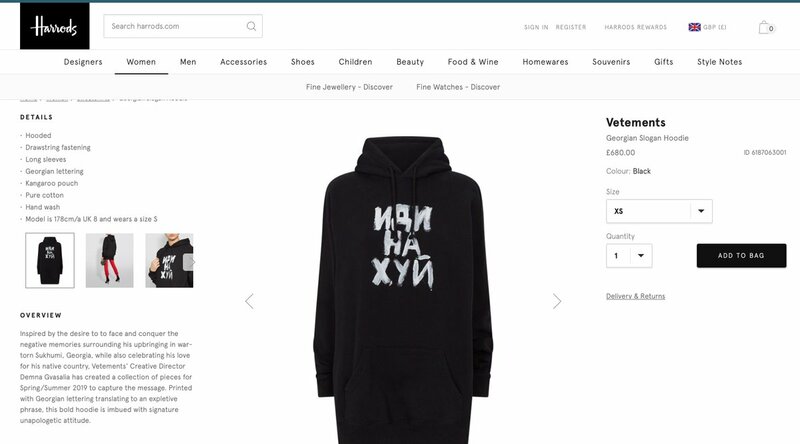 Luxury London department store Harrods is selling what it terms a "Georgian slogan hoodie," replete with "Georgian lettering" for £680 (€795/€893 in real money). Uhm … sorry, I don’t understand why this ultra chic hoodie can cost €795 and €893 at the same time. But I guess that’s not the core of the story, is it? Too funny how a pro-Russian troll trolled the European fashionistas. Anyway, the comment section of this TwitterTwat is absolutely worthy of your klicks!